Stone Soup Community Press, Inc. 501(c)3 Announces Their 2018 Charitable Distribution. — Stone Soup Community Press, Inc. The publishing program directly supports talented authors, editors, cover artists, and vocal artists within the LGBTQ community through above-market royalty and rate contracts. The writing fellowship additionally offers one talented writer each year an additional $3000 stipend to supplement the writer’s income throughout the writing and publishing process. 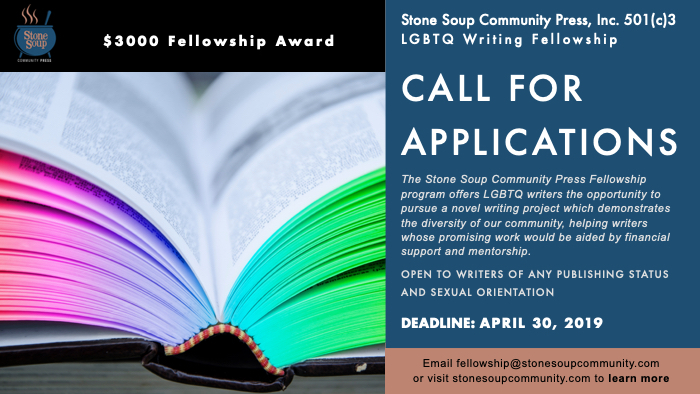 This fellowship is open to all LGBTQ authors regardless of their current publishing status. Therapy Café offers authors free access to a wide audience of potential readers to promote their works in a fun and engaging manner.